I've been meaning to do this for a while (unfortunately the motto of my life! ), I've created a facebook page for this blog. Most of my blog traffic comes from facebook. I must confess I'm almost always surprised at how many people click my links and come over to see what I've posted. Thanks for showing interest in what I have to say, especially when it can be so long-winded, rarely includes pictures, tends to be about the weighty topic of grief, and is often long ramblings of my personal thoughts. So a big THANK YOU! It means a lot to me that people are interested. I decided to create the facebook page for a few reasons. 1) Sometimes it just seems disjointed to post links to my blog about pregnancy anxieties and then something a little more typical for a facebook status like "I can't believed I burned my toast again! I swear half the loaf is in the garbage can!" I guess that's how my days really are. In real life it's not separate so I'm not sure why, but it just seems better to be able to have it coming from a different source. 2) A few people have asked me if it's okay if they share my blog with someone they know who has experienced a loss. My blog isn't private (meaning you can find it via google), but perhaps now it'll be easier to just direct them to the facebook page. 3) I often think that people may not want their news feeds inundated with pregnancy loss stuff so sometimes I just don't post blog posts to my facebook status. Yet I know some people are probably interested in it (or at least they click on the links when I do post it on my status updates.) I know you can adjust what comes through on your news feeds, but now you can like the page if you want to still follow this stuff. 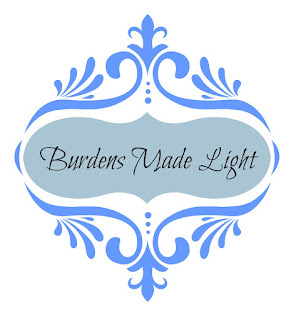 So be sure to like my Burdens Made Light page if you want updates. I'll be posting stuff from there in the future and not on my personal status updates. I would be foolish to try to deny that I received the best Christmas present ever! Well, I guess he arrived a bit before Christmas. We've loved having Jeremy with us through the holidays. 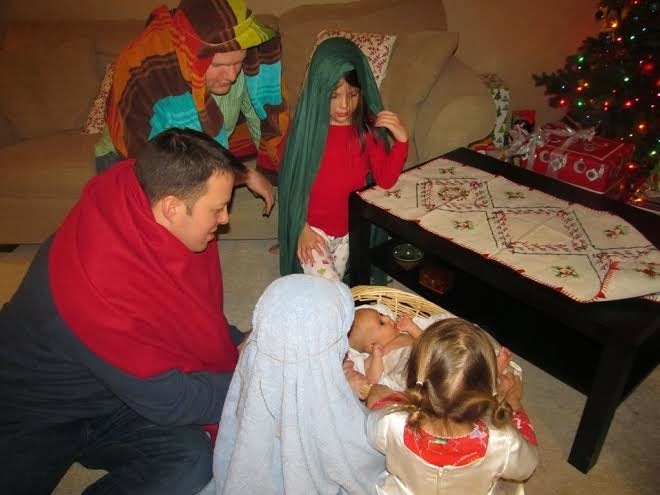 He even got to be the star of the show and play baby Jesus as we acted out the nativity on Christmas Eve with our nieces and nephews who live in Virginia. This year definitely contrasted last Christmas, when I had such aching, empty arms. Even though Jeremy is with us and fills our arms and hearts and time, we still miss our Luke. It's times like these that I wish we lived near Luke's grave. I wanted to be there for the Christmas Eve candle lighting that happens in the cemetery. If there wasn't a candle burning on his grave it isn't because he isn't loved. Because he is. Very much. I wanted very much to be able to honor him and bring something Christmasy to adorn his grave. Christmas morning, before we ventured over to my brother- and sister-in-laws house, I sat under our tree holding Jeremy and telling Trevor, with tears in my eyes just that. I wish we could have been there to honor him. But we weren't. So in my heart I carried the memory of Luke with me as we continued on our day with all of our festivities. Though it can be bittersweet, I am grateful for both of my baby boys. I let out an audible gasp, as I read the headlines about last Friday's shooting. I could hardly believe the terror I was reading. So many beautiful things have been written in response to this tragic event. I do not feel like I have anything profound to add. Yet, these sweet children and their families have been on my mind this past week. I think of them. I think of the heartache to lose a child. I don't know what it's like to be a victim of a terrible and evil crime. That is a pain and a trial I hope I never have to face. Yet I do know what it is like to have your world turned upside down when you learn that your loved one will no longer be a part of your life . . . or at least not in the way you imagined, because not a day will go by that you don't think of your child. I do know what it's like to have to behold a small casket and have a heart that longs for your child to just be in your arms again. I am heartbroken for these families --for the families of the children and the adults who were killed last week. I am grateful to the Parkers for, as hard as it must be, to have taken the time to speak out and allow many of us who are aching with them to hear from them and how they're coping. I am deeply impressed by their ability to not judge and to not harvest anger. Last night I watched as my first-grade niece read How the Grinch Stole Christmas to her little brother and sister. That could have been her. She could have been one the the innocent children taken from us. I feel like I can't look at these children the same way and I'm sure every parent has hugged and kissed their child a little more since that day. As my heart continues to ache for these families they continue to be in my prayers, as I am sure they are in many peoples prayers. While doing some Christmas shopping I had to take a break to nurse and change Jeremy. While I was in the nice mother's lounge in the department store many people came and went. Older women, grandmothers, and even young mothers like myself. Just as we were finishing up a young mother came in with her daughter. She was a cute little girl. As she laid her down to change her diaper the two of them smiled at each other and practiced words. "Bocas," the mom said as she pointed to her lips and her daughter repeated the words. "Ojos," the little girl said smiling as she pointed to her own eyes. "Bebe? Do you see the bebe?" The daughter says "bebe" as she sits in her stroller looking over at us. The mother and I begin to engage in conversation. "How old is he?" "6 weeks," I reply. "How old is your daughter?" "She's adorable." And I finish packing up our belongings with tears in my eyes. I have friends who had babies the same time Luke was born. I have watched them grow, but only through pictures since we've moved. I knew they were growing in size, but I hadn't consciously considered the developmental milestones they're moving through. It broke my heart to be missing out on that. Yes, I know that Jeremy will talk one day. But there I was, tears in my eyes, my heart so grateful to have Jeremy in my arms and with me, but hurting for the experiences that I'm not having with Luke. I miss him. And even though I know it wasn't his time to be with our family and that I will get to raise him one day it was hard knowing I don't have that now. The day after I gave birth to Luke I remember sitting in the corner of our sectional couch. I was wearing my purple dress from DownEast. It was Sunday and when I got up that morning I thought I'd at least wear a dress. I wasn't going to church that day but it was still the Sabbath. I sat there with the quilt that I had made for Luke over my lap. I felt numb and everything felt so surreal. It was overwhelming to feel all the emotions connected to what just happened. It was overwhelming to wrap my head around what had transpired in the previous 24 or so hours. Yet one of the most overwhelming feelings I recall was sitting there and feeling more than just a void in my arms. It was almost a tangible pain in the physical space in front of me. There was more than emptiness. It's almost like my arms were filled with my broken heart and I longed to be holding my baby...in fact I longed to hold any baby. It felt to wrong to have gone through labor and birth and to have no one there to hold. I wanted so badly to call a friend who had recently (or so I thought) had her baby. I just wanted to hold him. I, of course, wanted more than anything to hold my own baby, but I knew that was impossible. Yet I thought I could find some comfort in at least filling my arms with another sweet child, if I could not hold my own. I didn't have the courage to ask, so there I remained, with my aching, empty arms. In the darkness of the night after Jeremy was born I sat in the hospital bed and I was overcome with that same strong desire to hold my baby. I thought back to that sunny Sabbath morning and how strongly I had felt about needing to hold a baby then. 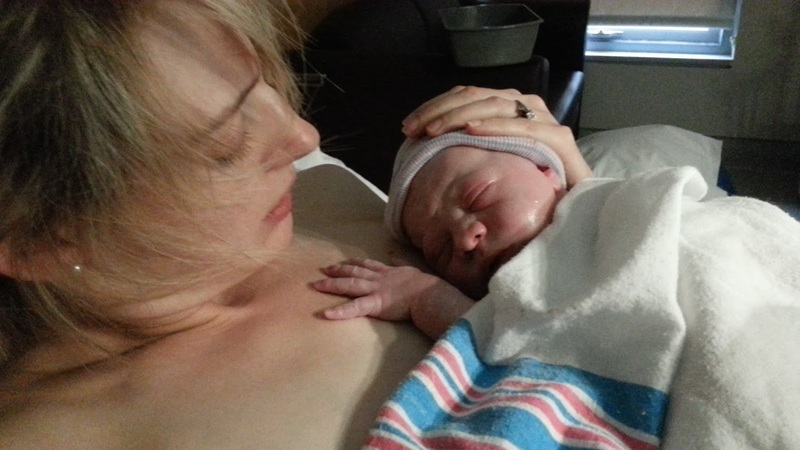 And now I had, yet again, experienced labor and birth for my son and felt that same feeling to be holding a child. How different things were this time. With Jeremy in my arms I wept. I wept tears of gratitude to finally have my empty arms filled. I held Jeremy closer and cried and poured my thankful heart out to God for this precious gift I have been given. To finally be able to be rid of that void is a gift from God that I am so grateful for. How grateful I am that God heard the pleadings of my heart and has blessed us with Jeremy. No. 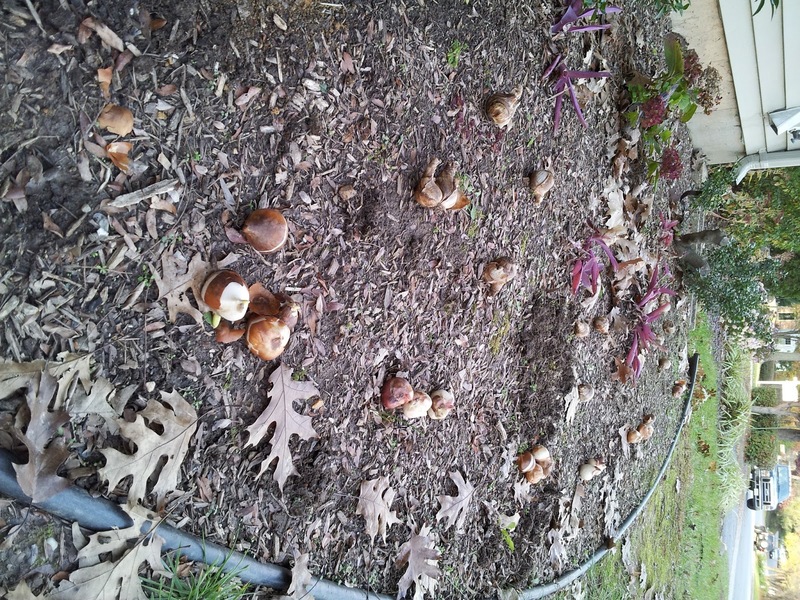 Those aren't really big acorns sitting in my flowerbed. They're tulip and daffodil bulbs. A few days ago Jeremy and I went on our first daytime outing/walk. We walked to a nearby nursery and I carefully selected an arrangement of flowers to plant. Yesterday I was able to resist snuggling Jeremy long enough to plant these bulbs. Being outside and breathing the cool, fall air was quite refreshing and it felt good to get my hands in the dirt. It seems like gardening is an opportune time for reflection. As I planted, I reflected on how I love the symbolism of spring, the new life, the celebration of Easter, and remembering that our Lord and Savior gave His life so that we could all live again. I thought about how spring is not near, yet it is essential that I prepare for it now by planting these bulbs before winter comes.
. . . I've typed and retyped words trying to summarize the thoughts I had about how this parallels our spiritual preparation, but I haven't found the right words to succinctly summarize my thoughts. So I decided I wouldn't try to put what it meant to me in to words, but just leave that for you to think about . . . if you want. I may not be able to take fresh flowers to Luke's grave as often as I'd like, but being able to plant these bulbs makes me feel like I'm planting flowers for Luke. 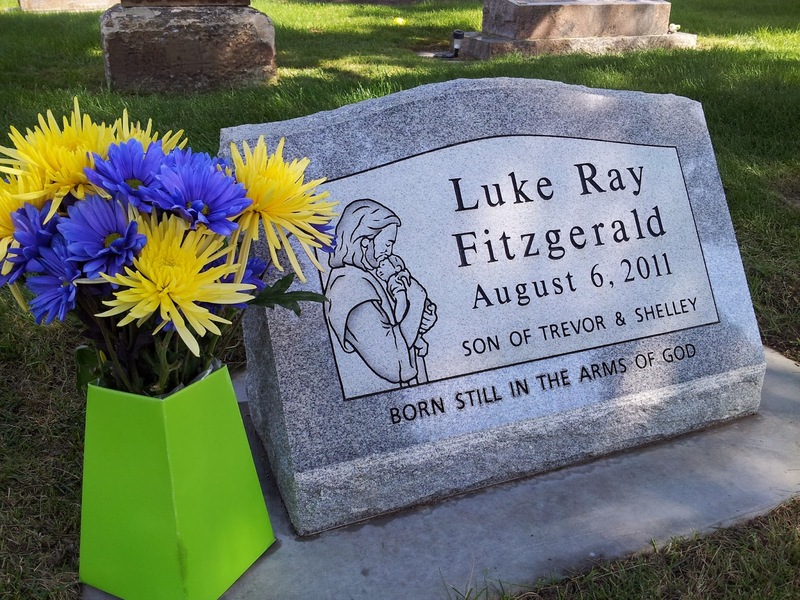 Last fall I planted flowers for Luke and I'm glad I was able to carry on the tradition here. I do not know how long we will live where we currently live. Perhaps this spring will be the only time that I see these flowers bloom. And perhaps next fall I'll be planting bulbs in yet another new location. It makes me smile to think that I'm leaving a flower trail in memory of Luke wherever I go. I completed this task while intermittently checking on Jeremy while he slept soundly inside. I couldn't help thinking about the contrast in mothering my boys. Jeremy is receiving mothering in the typical way, yet planting those flowers in honor and memory of Luke is also part of being a mother. It's just manifest differently. I love being able to show my love for my boys. I am not sure if I should write this from the point of view as it happened, since I didn't realize I was in labor, or looking back on it after it all played out! Everything happened in such a whirlwind that even as it was happening and shortly after, details seemed a little fuzzy. So even though I can barely tear myself away from holding Jeremy (he is at least laying on my lap sleeping as I type), I want to try to document his birth story before any more of the details escape me. I feel like every detail and moment of Luke's birth was ingrained in my mind and in my memory. It was a very emotional experience and even though it was so emotionally difficult to give birth to him, I didn't want to forget an instant of it. Perhaps because I knew it would be one of my only memories with him. It would be what defined him and me -- it was my role to give his little spirit a body and that's all he needed from this mortal world. Even though I hadn't thought through all of that, yet at the time I felt so tuned in to what was happening, who was around me, and how things were playing out. As it was happening I tried to hold on to the memory and embed each moment in to my mind, in spite of the difficult feelings surrounding the event. Jeremy's birth happened so quickly and perhaps because it is just a small page of what will be his life's story, instead of the event that defines his life and death, I didn't connect with the events and the moments as deeply or as emotionally as I had with Luke's birth. Laying in bed I can feel contractions. I had been experiencing "braxton hix" contractions for a while, but these felt a little different. 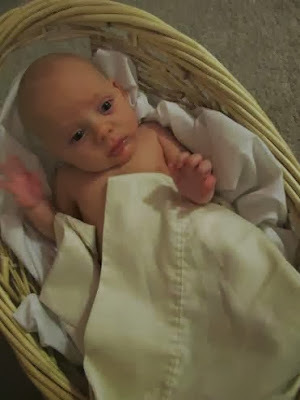 I had been through labor with Luke, but it was completely pitocin induced, so even though I had felt what labor and birth was like on pitocin, I hadn't experienced going in to labor spontaneously. I knew that my contractions before had felt like strong menstrual cramping. The contractions this morning felt mildly like what I remembered the early part of my labor feeling like. I didn't think too much of it though, especially because when I'm feeling "uncomfortable" I try to brush it off and not focus on it. After Trevor was off to work I spent the morning bustling around the house cleaning things. I finished organizing some paperwork in our office, worked on packing my hospital bag (I had started a few weeks ago, and had been meaning to finish it up), did some organizing in the nursery, and tidied up clutter here and there in the house. Was I doing some major tiding and cleaning because my pre-school age niece and nephew were coming over and they'll get in to anything you leave laying out and I wanted my house to be tidied when my sister-in-law came over? Or was it really an early sign of labor --nesting? As I worked around the house the contractions seemed to happen more and more frequently. I could feel them in my lower back, but they weren't painful. I could just feel them and I thought they seemed different than they had been in previous days. Some of the contractions would cause me to be uncomfortable enough that I would plie (squat) and breath and try to relax through them. I would imagine the contraction simply widening my cervix. I turned on some music (an old EFY We Believe CD) while I was working and sang along as I remembered recently re-reading about the connection to our throats and our cervix and how relaxing one will relax the other. Singing had helped the laboring woman I read about. So sang as I worked, I did, and it seemed to distract me as I bustled around the house. I only remember one contraction that morning being strong enough that the most comfortable way to work through it was rocking back and forth on my hands and knees. I didn't think this could actually be labor, especially because I had just been reading about labors that have started and then stopped for a couple weeks. So I kind of just accepted that this was just early or false labor. Nothing too serious . . . I think . . . but am still not sure. Maryanne and her kids come over. They watch Tangled while we work on preparing some freezer meals I wanted to have ready once our baby is born. I also was making a huge batch of chili for a church Halloween party that evening. When I ran to the grocery store that morning I wondered briefly if I should just ditch the chili in case I was in labor, but opted to make it anyway. When Maryanne came over she inquired why I was wearing a dress. "Oh no reason, I just threw it on." I do often wear skirts and dresses, but if I were in labor and something were to happen I thought being in a dress would be easiest to deal with ...you know water breaking or a baby coming out! I just didn't tell her that! While we're cooking I finally fess up. 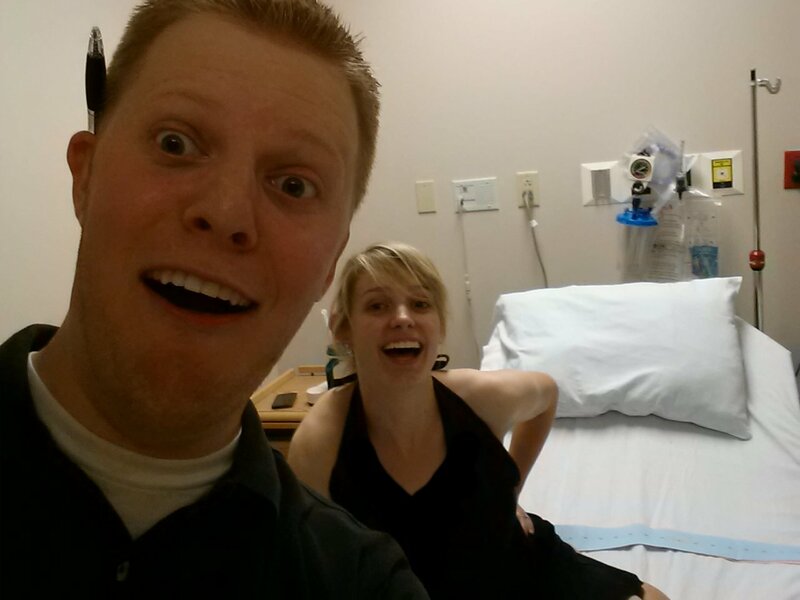 "It's been kind of an interesting morning..." and I admit to having contractions. I start to tell Maryanne each time I feel another one. Noticing their proximity, Maryanne finds a pen and paper to start keeping track. 12:21 PM the contractions seem to be happening about every five minutes. Maryanne had to leave to go pick up a friend's kids. She was hesitant to leave me home alone, but I felt like it would be good to have some alone time. I decided to run a bath --knowing that if this wasn't really labor the bath would probably slow things down and we would know it's all just a false alarm. Contractions keep happening about five minutes apart. Nothing is slowing down. I call the midwives office to see what they thought about things. No answer. I leave a message. 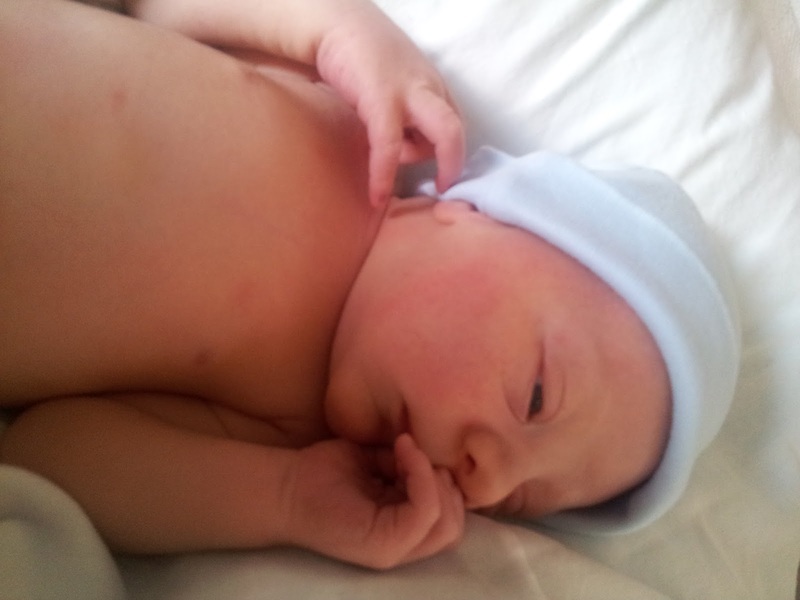 Still waiting to see what the midwives say, I decide to give Trevor a little more info. Not knowing how to respond or possibly not seeing the last message because I decide start getting ready to go to the hospital just in case, I still wait to hear from the midwives to determine what to do. 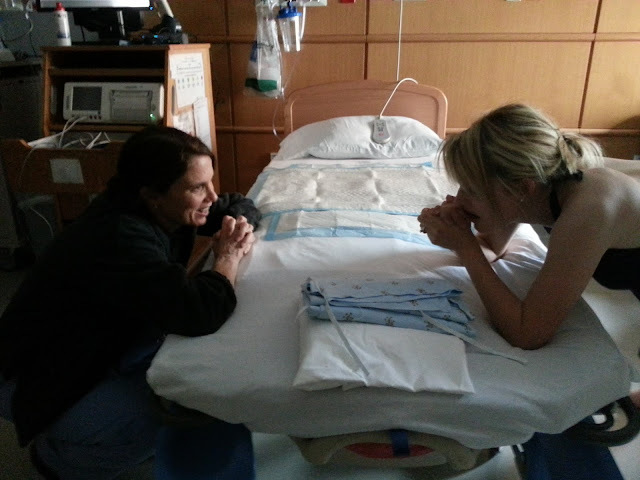 The midwife on-call, Laura, returns my call. I give her the run-down of my day and express my uncertainty of actually being in labor. She trys to ask details of intensity and length of contractions. I had only been tracking time between them and trying to not pay too much attention to them otherwise. She advises me to come in so they can check me. She admits that they may just send me home, but says that she just has a gut feeling that I need to come in. I'm okay with that. I call Trevor to give him the update. I proceed to finish packing the hospital bag (good thing I started working on it that morning!) and decided to blow dry my hair. I realized it could be a few days before I get to wash my hair again! Laura calls back and asks if Trevor is home yet. I inform her that since I talked to her last, I had what's called "bloody show" during one of the contractions, so I was a little more certain I was actually in labor. She tells me to leave as soon as Trevor gets home and not to hang out at home any longer. Trevor gets home and we're headed to the hospital. Contractions are starting to be about 2 minutes apart. I try not to pay attention to their frequency, but it was hard not to because the clock on the dash board was just staring me in the face! I tried not to look at it. They were getting more intense, but honestly weren't that bad. I was kind of uncomfortable, but not in pain. Trevor drove quick, but not like a maniac! Thankfully! He admitted that despite our conversation two days before he did not really want me to give birth in the truck after all (Just three days before we had seen this news clip about a baby born on the beltway when they were stuck in traffic. Trevor, at the time, admitted he thought that would be really cool if we had our baby in the truck. I was glad he changed his mind). I told him we had time and weren't in a hurry. 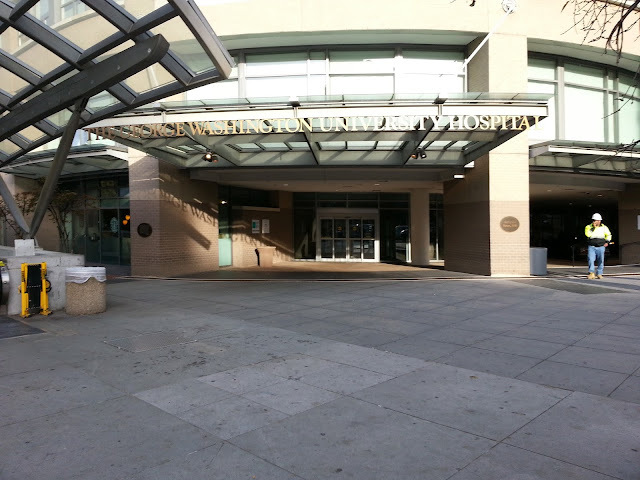 Although as we approached the hospital, we did run a few red lights. They were tiny intersections and the pedestrians looked at us like we were crazy, but there weren't even any other cars around. No sense in waiting! Especially because the closer we got the more intense things started to get for me. I think we were both still in shock that we were headed to the hospital to have a baby! It definitely hadn't been on our agenda....or even our radar for that matter! I left Trevor to deal with the vallet parking at the hosptial and decided to head straight up to the labor and delivery floor. I got in the elevator with a handful of people. I almost forgot to have them hit the button for me. "The third floor is labor and delivery, right?" "Yeah, when are you due?" someone inquired. "Right now," I said. I was certain they didn't realize I was laboring right before their eyes! I tried to check in and even though I had pre-registered they couldn't find my information. Frustrated was an understatement as I was asked to fill out paper after paper! Luckily Trevor came up shortly and signed everything for me. I was sent to the "triage" room. (Why is it even called that?) What? Triage!? I tried to ask about this at a prenatal appointment. I was hoping I could bypass this part. I was ready to go in to a delivery room. I brought my own gown (I had wanted to avoid feeling like I was in a hospital) and changed in to it. I could feel my contractions getting progressively stronger and I was feeling frustrated that I was in this triage room beings asked more questions and to sign more papers. Seriously?! Is this happening?! I'm not sure if I requested it or if Trevor did, but I was finally brought a birth ball to sit on. For me, having pressure on my perineum and being able to move (which the birth ball provides both) really helps me deal with the intensity of contractions. As I worked through them on the birth ball I guided Trevor to apply pressure to either my shoulders or stroke my arms to help me relax. "How long to do I have to be monitored before I can be admitted to a room?," I asked the nurse. I was informed we had to wait for Laura to come check me but she was in another birth right then. I could feel myself starting to get shaky. I knew this was how I felt toward the end of laboring with Luke, but didn't think too much about it. I just knew things were moving along and I was anxious to get into a room. I also knew that I was GBS positive and needed an IV so I could start getting antibiotics. I was eager to get admitted, but didn't sense any real urgency from the nurse assisting us. Hanging out in Triage. Trevor, perhaps a face of disbelief! Me, definitely holding my back because I was possibly mid-contraction! Laura finally arrives! What a relief it was to see her. She has me get on the bed so she can check my dilation. It hadn't been checked until this point. She informs me that I'm at 9 cm!!! Needless to say I am quickly admitted to a room directly across the hall! I knew I was far along in my labor, but had no idea I was that far along! It was astonishing to realize it was practically over ...it seems like it had all just started! All of the events kind of blur together at this point as it all happened so quickly. Nurses, nurses' aids, my midwife Laura, and the midwifery student Hannah all bustled around getting things ready. I labored kneeling/leaning over the side of the bed. I remember seeing Laura washing up at the sink and between contractions I said, "I'm glad I didn't pay a thousand dollars for a doula!" I really almost had because of all my anxiety about the potential emotional ordeal laboring might be. I had felt like I needed someone there who understood me and where I was coming from. Someone who knew my history. Someone who could be by my side for the entire length of my birth if it were going to be a long ordeal. Miraculously my labor wasn't long at all and once she joined us Laura didn't leave us. And even though we had just met her that week (the midwives are on a rotation and you meet with a different one at each appointment), Laura was the emotional support I needed. She was compassionate and sensitive to us and everything considering my previous birth with Luke. Everything had been just spiraling into action so quickly I hadn't had a moment to think about anything, but then it hit me. I broke down and cried in disbelief, amazement, gratitude, and relief that my baby boy was about to be born. Leaning over the bed I cried and told Laura I couldn't believe it. I couldn't believe that we'd made it and that we were here and he was about to be born and he still has heart beat! I was going to be giving birth to a living baby! As the contractions got stronger I was breathing deep and moaning through them. I believe someone proped up the back of the bed. I was still on the bed on my knees and when I wasn't holding Trevor's hands I think I had my hands clasped together and I would lean forward against the head of the bed, almost in a prayer position. At one point, between contractions, I said something along the lines of, "What should we dress him up as for Halloween?" I think everyone got a good laugh at that. My mind had just been racing with disbelief that Jeremy was already going to be born! I hadn't thought he'd be born in October! 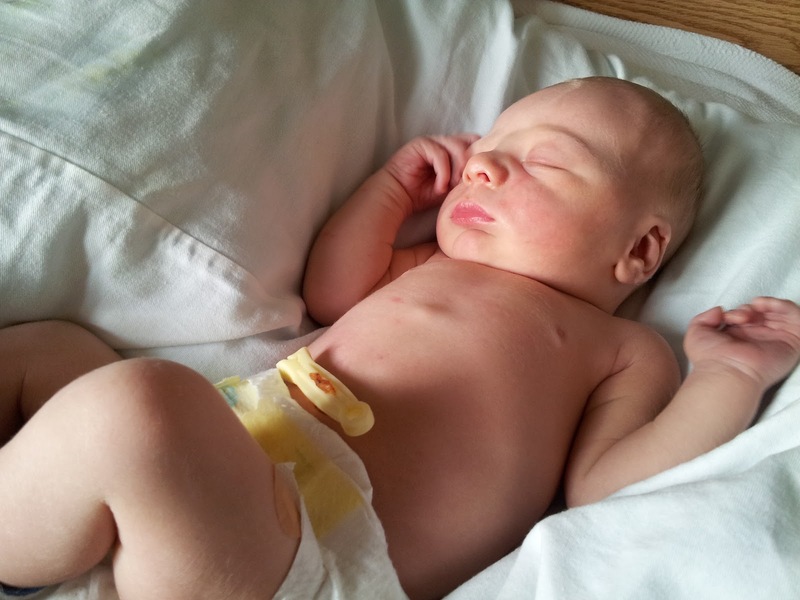 Another thing I kept saying lightheartedly throughout my labor was, "No big deal." I don't know how much I was saying out loud or what was just running through my head, but the thoughts were along the lines of We're going to have a baby today, No big deal. I'm in labor and almost ready to push him out, No big deal. We woke up today like it was a normal day, but now we're at the hospital having a baby, No big deal. I dilated to a 9 before I was even admitted, I got this labor thing in the bag, No big deal. Though things were plummeting forward almost quicker than they were ready for, I think my attitude kept the stress levels low in the room ...well ... at least I wasn't feeling stressed! I didn't know who at the time, but was later informed, that Hannah (the midwifery student), upon my request, used a hot compress to apply pressure to my perineum for relief. I also reached down to help apply pressure and could feel the pressure and structure of a head working its way out! As contractions strengthened I simply felt things change and get stronger as it was time to push. As his head was crowning things transitioned from just being intense to actually being painful. Grimacing, grunting, and pushing with all my might during contractions I proclaimed, "THIS HURTS!" and other phrases expressing the pain I was feeling. I knew it was the end so I wasn't concerned, I was just stating how it felt and I was eager for it to be over! I tried to still relax, but was definitely quite tense and shaky and it was a painful, burning feeling as his head was descending and pushing on my cervix. This part of pushing hadn't felt this way with Luke's birth. It didn't hurt like this before. Perhaps I hadn't felt the pain before because my emotions were stronger than anything happening physically. At this point of Luke's birth I was simply weeping and pleading in my heart for it to just be over. I just wanted him out of me and didn't know how much more of it I could take. Yet with Jeremy, I wasn't as emotionally engaged and was just focused on the whirlwind of labor that had suddenly come over me. I think, I was still holding Trevor's hand tightly during contractions, but I'm not really sure. After a strong contraction and pushing they informed me that my water broke and that he was almost out! 4:23 PM About two more contractions later he was out! From what I was told, once his head was out he just slipped out the rest of the way. I reached down between my legs and they helped hand Jeremy to me! They also assisted me in getting turned around so I could hold him on my chest while I birthed the placenta. I had been so focused on my job of laboring and getting him out I hadn't had a moment to wrap my head around what was really happening. Still in disbelief I held my son in my arms and simply tried to soak in what had suddenly become my reality. I was holding my living, breathing, healthy son in my arms. What a miracle words cannot describe. What an answer to so many prayers. I was holding a miracle in my arms and I could hardly believe it. Trevor got to cut the cord once it had stopped pulsing (gotta get all that cord blood into baby!) and I think I delivered the placenta without even noticing. One of the midwives commented on what a healthy looking placenta it was. I felt so accomplished and proud when I heard that comment, because I had worked for nine months to be as healthy as I could in order to grow a healthy baby, placenta, and have a healthy body ready for a natural delivery. We got to examine the placenta as they showed us which side had been connected to me and the sac that Jeremy had been in. It was so different to see it all and just be able to observe it in fascination, instead of as an explanation of what went wrong. 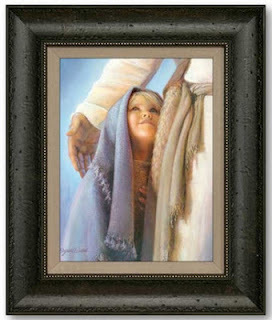 What a tender mercy from God and an answer to prayers that I would go in to labor spontaneously. What a blessing I went in to labor before we had to even question whether or not or when to be induced. What a blessing I didn't have to sit through the weeks of non-stress tests and anxiety if something was going to go wrong in the final days of this pregnancy. How grateful I am for another quick and easy delivery and grateful for the prayers of the family members who knew I was in labor. Luke, are ever on my mind. We are currently consumed with loving and taking care of your brother, Jeremy, yet I think of you often. I love to hold Jeremy in my arms when he's sleeping and look at his little face. I am able to see and remember more clearly your sweet face and what it was like to hold you in my arms. This won't last, because Jeremy will grow, and will shed his newborn looks. But for now I love being able to see a resemblance of you in him. Luke, I love you. We all love you and are so grateful to have you a part of our family, even if you aren't here with us now. Jeremy is lucky to have you as a brother to help look after him. This little guy can be born because all that doesn't really matter. We just want to meet him and hold him in our arms and love him. I wouldn't have guessed that 24 hours later I would be in the early(?) stages of labor! As I share Jeremy's "birth story" it is his story, but like I wrote about, it is so interconnected with Luke's birth and my feelings and experiences with him (many of which I had hoped to capture in the written word for my own remembrance, but hadn't yet). And those are the feelings I intend to share on this blog. Yes, there are so many other details and wonderful moments we've already expereinced with Jeremy, but I don't intend to write about every milestone, smile, coo, progression in nursing, diaper change, or sweet moment and memory created. Perhaps some of that will be worked into this blog, but that is not the intent of my blogging. This blog has been and, for now, will continue to be a place for me to process and preserve my experiences as they relate to the loss of Luke. I'm keeping a personal journal with many of those other details as they relate to Jeremy. Oh and in case you weren't sure: He's perfect in every way (yes, we're biased!) and we're so in love with him!!! One early morning a few months ago (yep another one of those sleepless mornings) I found myself in the nursery in the rocking chair. With some baby clothes in hand I just sat there and cried. It didn't feel right to be feeling the anxiety of a soon-to-be new mom. Feeling like there was so much to do before this baby is born. Feeling frustrated that I still don't know if I have the things I need for a baby. Enough clothes? The right sizes? The right seasons? How many diapers do I need to stock up on? Are there other items I need but I just haven't thought of? Here I was trying to figure this all out like it's my first time. I hated sitting there feeling like I had so many unknowns about what my life was going to be like as a new mom. Feeling unsure about labor and delivery. Feeling the wonder of how I'll be as a parent. I hated feeling all of this because it didn't seem fair. I had already felt these first-time mom feelings. I had already been down that road. I had already sorted through these anxieties once before. I had already been all prepared to bring a baby home. But there I was with the same unknowns still ahead of me. There I was needing to prepare to bring my baby home. It didn't feel fair that I was going through all of this again. I've already had my first baby. I didn't like that these were the worries weighing on my mind all over again. I've been through this before ...and for what? So I cried about it. I cried and pitied myself. I needed that cry and (I'm sure lots of women could agree) sometimes you just feel better after a good cry. And thankfully since that early morning I've had a change in outlook in preparing for this little guy to join our family. Perhaps it's just been an outlook change on how I see myself and life. With Luke I wanted everything to be just perfect and for everything to be perfectly ready and in place for his arrival. I've realized now that there will always be more to do and more to get done and that's okay. I've realized that I'm just going to do my best and the rest will just have to work itself out. It's not worth getting stressed out about. Do I see things this way now because I can see that nothing seems to go as planned in our life? Or am I seeing things this way now because it was too wearing to beat myself up over things that I didn't do or didn't go perfectly? Either way I'm grateful I'm coming around to a more relaxed outlook -hopefully not to be confused with complacency or idleness. Either way even though there are baby clothes to organize and a nursery to finish getting ready, it's okay. This little guy can be born because all that doesn't really matter. We just want to meet him and hold him in our arms and love him. The other morning Trevor asked me how I was feeling about giving birth. Sometimes it's like he can read my mind. In the early mornings when I'd wake up (pregnancy induced bathroom brakes and trying to stay comfortable in bed) I'd been thinking a lot about birth struggling to settle on how I really felt about it. It was weighing on my mind so much that sometimes it was keeping me from sleeping. Luckily Trevor helped me sort through some of what was on my mind. In anticipation of Luke's birth, I finally got to a point that I wasn't fearful of the experience and actually excited for it. A lot of my shift in mentality came when I read Ina May's Guide to Childbirth which had been recommended by my friend Brittney as a must-read while I was pregnant. I finally read it in some of the final weeks of my pregnancy (and wrote more in-depth about that here). As I begin again to prepare for birth my mind, cannot help to turn to my past experience. It's all I personally know of birth so far. Yet, much of the literature and natural birth classes guide you to not think about or dwell on past birthing experiences, because this birth is a new birth and it will be different. While I agree that each birth is different, and we are hoping that this one is quite different in a significant way, I wasn't settled trying not to think about Luke's birth. As I was able to talk to Trevor about it he pointed out that I probably didn't want to push aside thoughts of Luke's birth because forgetting his birth or trying to push it out of my memory, in a way, would be like pushing away my memory of him. Luke's birth, though so emotional trying and painfully hard to bare, is what connects me to him. Those 9 months of pregnancy lead up to the culminating point of his birth. I did that . . . suffered that . . . accomplished that so that he could have a physical body that one day will be his again. How could I forget that? I could I forget that day and those few short hours after his birth that I actually held him in my arms? Trevor also raised the point that the natural birthing literature gives that guidance to woman who have experienced painful births and are now trying to have a painless or relaxed birth, so they need to not dwell on the pain they had previously experienced. Well lucky for me I didn't think Luke's birth was physically painful (intense, yes, but painful, no). Lucky for me I am confident in my body's ability to handle birth. I am so grateful to not have that element of fear to deal with. So as I prepare my mind and my body for this birth I do not need to try to forget about Luke's birth. Luke's birth shaped me and is a part of me and I don't need to let that go just because I am about to experience another, but different birth. We cannot sever our past experiences from the path that is our life. Each past experience is a part of our individual journey. The road ahead may be unknown or unclear, but I am ready to travel it and create new experience--all of which will be affected by the things of the past. Yet that was Luke's birth and this will be this boy's birth. They are separate but very much connected. And as I sort through all of this I realize that that is okay, to let my past be a part of my future. These events are a part of me, my children, and my family. It's all a part of the experience Heavenly Father has given me that is molding me into who He would have me become and who I need to be. But now, O Lord, thou art our father; we are the clay, and thou our potter; and we all are the work of thy hand. (Isaiah 64:8). Waking up in the middle of the night or early morning isn't uncommon for me these days. Actually I don't think it's really been that uncommon over the past two years - with going through almost 18 months of pregnancy now chances are I've more often than not been in either the early stages of pregnancy when your blood level is dramatically increasing and your up in the middle of the night to use the bathroom or in the later part of pregnancy when it's either more of a challenge to get comfortable or you're also up using the bathroom because the baby has left no room for your bladder. Well here I am again. Awake. At about 4 AM. Like usual, there seems to be a myriad of things on my mind. I don't know what it is about waking up in the still, dark morning that makes it seem to surface. Perhaps because during the normal waking hours of the day things, and people, and "to-do"s push aside the thoughts, but in the quiet morning there is nothing to reign these thoughts in and they just run free like a wild horse. I am currently 36 weeks pregnant. Within a week I will be considered "full term." This means I'm almost in what I'd call my due month, because (in spite of what many people might think) 40 weeks is an average of when babies are born, but it somehow has become the anticipated day. If your baby comes past that day he or she is "late" and if your baby comes before that day he or she is "early." I participate in a weekly volunteer service for my church and part of the qualification is that you cannot have children at home. All of the other women are empty-nesters and, needless to say, a different generation than me and many of them are even a different generation than my mother (some might call them old, but when they have the energy and spirit that they do "old" does not describe them). I love talking with these women and when you have belly the size of mine it's inevitable that conversation will turn to the topic of birth. I love to hear these women share their thoughts on birth. Several of them have shared that their babies came a month past their "due date." One of the women even commented that there's no way that would happen these days -especially in a time where we have to have everything planned and scheduled. I'm sure there are other more official medical resources for this, but even the March of Dimes website addresses induction and says that it may be recommended after 42 weeks or if there are other medical complications. However, that doesn't seem to be the standard that is actually kept in our society. After lots of research about birth and how it works, I came to truly believe in the natural process of birth. Mom's bodies vary (particularly different menstrual lengths), babies growth can vary, and when they are ready to be born should likewise also vary. With Luke I was very comfortable waiting for labor to begin on its own because you're most likely to achieve a successful vaginal birth if you do. I had accepted this variation and was inclined to wait until my body and baby were ready. And that's when we were thrown the curve ball no one was expecting. I was healthy and my baby was healthy. And then he was gone. What happened? Or minds and our hearts were in disbelief to discover our baby was suddenly no longer living. At that point I was induced. Luke was born and we discovered the knot in his umbilical chord. Still believing in the natural process of birth, I have found a practice of midwives who support natural birth to provide my prenatal care. So many of their guidelines you must follow to be a part of their practice align with what's important to me -particularly the importance of healthy eating during pregnancy. If you are healthy (which you should be because they only take low-risk moms) they have a strict no-induction policy before 42 weeks. So what do we do this time? The facts are still the same. Birth has the least amount of complications when you wait to go in to labor on your own. Birth is still a natural process that the female body is capable of. Nothing has changed . . . Except for my whole life and world, because my baby died. The head midwife worded it well when she said that you fell like the natural process of birth failed you. And in a sense it did. We did not come home with a baby. Of course, I believe the hand of God is in all things and that He did not fail us and that if Luke were to live on earth right now God would have made it so. Nevertheless our experience can lead us (particularly Trevor) to question the natural process of birth. Fortunately, because of our history, the midwives are willing to work with us concerning induction. There have been some days in the past few weeks when the worry and wonder if my baby is still okay inside of me weighs on my mind. If I haven't felt him move am stricken with panic. Sometimes this is resolved by a sudden kick from within as reassurance and other times this is resolved by using the Fetal Doppler my friends sent me (I still need to write about that!). Yet these moments of fear have not yet pushed me to feeling like I need to be induced. Although I'm not sure what we'll do as we get further and further along. Play it day-by-day, I suppose. Things are still looking good. I'm healthy. This baby is healthy. And we're still working on preparing for his arrival. It will be interesting to see how all of this plays out! Last week I was thrown a baby shower. I am so grateful to my sister-in-law, Maryanne, who initiated it, my friend Jenny for hosting it and all the friends and wonderful woman from church who also contributed and were in attendance. I was so astounded and overwhelmed by the generosity and kindness of each of these women. Before the shower took place, I confessed in an email to one of the women in charge of things, "It's a little strange feeling like I shouldn't really be having a shower since this isn't exactly my first go around at this . . . yet it kind of is." 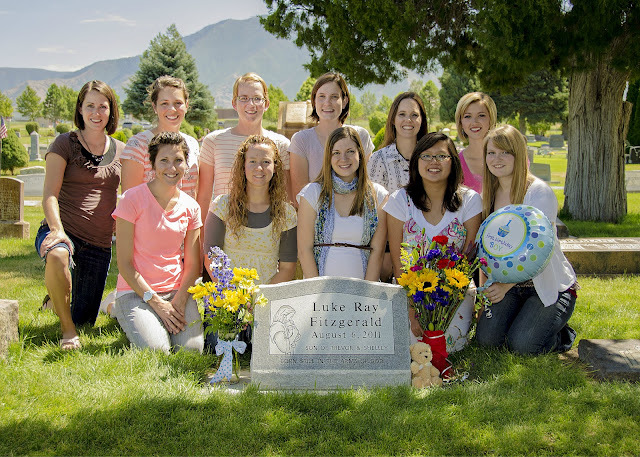 How grateful I was for her response, "Usually, this ward does a baby shower for each baby. Each child is a special gift and should be celebrated!" I was so grateful she reminded me of that and I love that that is the culture and tradition for this ward, because it's true. This baby is special and a very special gift! I am so grateful to be pregnant and to be having a healthy pregnancy. I am grateful Heavenly Father has allowed us to be the parents of another one of His children. I am grateful for this boy and am so grateful to have friends and family members to join me in celebrating him! We are truly so very blessed! Did I mention how spoiled I was with so many great gifts!? So much beautiful AND delicious food! Loved the mini fruit and yogurt parfait bar! How grateful I am to have had this special celebration for our newest family member. We are getting so excited to get to met him and hold him in our arms! This is a continuation of thoughts of my "not feeling connected" post, so if you haven't already, feel free to read that one first. In the other post I started to address how I've yearned to feel connected to this baby, yet things that I thought would make me feel "connected" often came with other difficulties. As I get closer to the end of pregnancy some of these feelings are not weighing on my mind as much as they were a few weeks ago, perhaps because they are overcome with other thoughts now or perhaps because I have been able to resolve them; nevertheless, I still wanted to write about them. When I took the time to write about a child it was usually Luke. Though it's been over a year since Luke's death, my life is still intertwined with tender moments of grief, missing him, and longing for him. It sometimes consumes me and my emotions. Feelings are still so strong and poignant. Heartache is still so real. For that I am grateful, because I hope I never come to a point that I don't long for my son. He is truly a part of our family and always will be. Yet this was making me feel like there was a void . . . like I should feel so passionately about our son who's currently in my womb. Shouldn't my love for him be as strong as my love for Luke? While I was in Utah last month I was out to lunch with my best friend Annie (grew up together since we were 2- and 3-years-old) and her older sister, Liz, and their kids. I expressed some of these feelings to them as we ate lunch at Cafe Rio. How grateful I am for Liz's insight and reassurance as she shared her own experience of when she had her second son. She explained how she loved her first so much she could hardly fathom having that same amount of love for another. Yet once he was born the overwhelming love felt for her first she again began to feel for her second. For me, it was reassuring to know she felt that way. And perhaps other moms do to. I realized that for now it's okay that I don't feel the same overwhelming love for this baby that I have felt for Luke and that my love for him will grow --especially once I get to hold him in my arms. Which brings me to my next point . . .
Part of how I feel connected with people is being with them in person. This is probably true for most people, but for me it's especially true because (whether or not you agree with or have even heard of the "5 Love Languages" book/theory) I fall under the category of "Physical Touch." I feel loved receiving hugs from friends. A back-rub is one of the best gifts I could receive. Physcialy connecting with people is how I both feel and show love. Getting hugs from my nieces and nephew when I go over to their house is the greatest and I usually depart by being sure to give them hug as I tell them I love them. When I hold my nephew, Dallin, in my arms I feel so much love for him. He's not my own child, but when I have him in my arms I can honestly feel my love for him increase. Recognizing and acknowledging attribute as it pertained to this situation, I feel like I was able to reconcile not feeling overwhelming amounts of love for this baby. I reconciled having more feelings of connection to Luke than I do for this baby is in part because I held Luke. I met Luke. I gave birth to Luke. I got to see his face and hold him in my arms. And for me, that's part of how I feel connected to him. But I have not done that with this child yet. I have not held him. I have not seen him. I have not been able to kiss his little face. So even though he is inside of me and I should feel connected to him, because no one else in the world is closer to him than I am, feeling kicks simply isn't the same thing as holding a baby in your arms! I have finally come to a point that I don't feel guilt for not feeling as much love for this little guy. If anything it is just making me all the more eager for his arrival so that I can hold him in my arms. What a journey of learning and emotions this is! Oh motherhood!, how much I am learning --about myself, about life, and about love --that I never could have foreseen! I know that part of my decision to announce my pregnancy so early this go-around (pretty much the day I found out) was to be able to keep an honest record of what it's like --being pregnant after just buryinging your first baby. I've been pretty decent about trying to take a weekly picture (I've skipped a few weeks here and there) of my growth and writing about things that are going on. I opted to keep that as more of a personal journal and not one that I simply publish for anyone to read. Maybe because it seemed like it didn't have enough content or might not be interesting to any readers, "gained a little weight this week...trying to be consistent in drinking enough water...been super emotional, but am grateful for a patient and loving husband..." or whatever else I happen to write about. Or maybe I don't write about it openly because in a sense it's been hard and maybe I haven't wanted to be honest about that. When I first found out I was pregnant I was super excited and thrilled beyond belief. I knew my (and many other's) prayers had been heard and Heavenly Father had blessed me with what I had been pleading for for 6 months --to have another chance at being a mother, here, in this life. I don't want to ever seem ungrateful that that prayer was heard, so please don't misunderstand me as I try to synthesize my thoughts about this pregnancy. I know there are so many women trying to get pregnant who would give anything to have the plump round belly that I now carry with me. I know how hard that can be. I've been in that category of women, trying not to be jealous of and covet every pregnant mom I'd see. So, I guess I just ask for understanding from that group of people -yes, it's hard to not be pregnant when you want so badly to be, but yes, it's also hard to be pregnant after you've lost a child. From the get-go, I've yearned to feel connected to this baby. Perhaps out of fear or at least the knowledge I have now that my time with him could be limited. I've wanted to be able to have felt close to him, to have loved him. Well, that's the difficult part for me. I know some moms feel connected to their baby's spirits practically from the instant they conceive. I don't. So I anxiously waited until the time that I could at least feel this baby move. Or until the time that I could know his gender. But it seems like both of those things came with more unforseen difficulties. Yes it was a miracle to feel this baby move for the first time and was an answer to my heartfelt prayers and pleadings to feel close to this baby. And for that I should remind myself to be grateful. Yet now that I feel movements . . . when I haven't felt movement in a while, how do you suppose I feel? Fearful. Anxious. Concerned. All of the above. As for the gender . . . it was definitely a surprise to be having a boy. Of course it's always a "surprise" to find out the gender of your baby. I really thought I was going to be having a girl though. With Luke I thought I was going to be having a boy and I did, so I thought perhaps I had that "mother's intuition." We also had family members even have dreams with our baby girl. And so many of moms I know who have lost a baby have had the opposite gender next. I thought it would be easier to have a girl next so surely Heavenly Father would bless me with that. Well, as you know no mother's intuition, no fulfillment of dreams, and no little girl. Of, course I never want our son to think he wasn't wanted just because I thought it would be easier to have a girl. That is in NO WAY the case. It just made things a little more difficult (like this shopping outing I wrote about back in July). So truth been told. It's been kind of difficult for me and perhaps I've avoid writing about it because I didn't want to complain or possibly even admit how I was really feeling. It was hard to not feel connected to my baby and perhaps in a way I didn't want to admit that that's how I felt. If anyone is still reading, I opted to continue on to the next part of my thoughts in another post, the good news is since starting this post a while back, I've been able to reconcile some of my thoughts and feelings. So I'll post about that shortly. I realize that taking the time to write was a gift that I gave myself --especially while we still lived in Payson. If Trevor was a work or school and I spent a few hours in the morning thinking, reading, praying, crying, writing, or whatever I felt so inclined to do, I simply gave myself permission to do that. Since we moved I wonder if I've felt like there has "been too much to do" so I haven't allowed myself to write the things that are in my mind and heart. "I'll do it later" runs through my head . . . and then I never do. Or I'll start writing and never finish . I haven't not been writing because I haven't been sorting through emotions of loss and pregnancy after loss -I just haven't given myself permission to do it. Or maybe it's just been to overwhelming to try to sort through it along with everything else. Since we moved in May emotions have definitely been all over the place for me! Perhaps in part because of pregnancy hormones yet perhaps because of other things too! I was starting to wonder if I was simply crazy and an emotional basket case when I confided in a woman in my ward. Thankfully, she reminded me about all the different stresses (some positive and some negative) in my life that I've gone through in the last year, she reassured me that it's normal to have some breakdowns. So even though I feel like generally I'm okay with "dealing" with these things and even enjoy many of them the fact of the matter is that they are pretty big stresses. So while I try to be positive and happy I think all the change has taken a bit of toll on me! Hopefully I can recommit to giving myself the time to ponder, write, and sort through thoughts and feelings because there are so many of them! I awoke in the early morning today. Possibly because we were sleeping on an air mattress and possibly because I could hear the cries of another little boy who had awaken at our campsite. My heart ached for you. I laid there in the dark, cool morning and just thought of you. I thought about how I got to hold you in my arms for a brief time. I missed you. I longed to have you in my arms again. Often times in pregnancy I have sleepless nights. Not because I'm physically uncomfortable, I usually do okay in that boat. But when I wake up to use the bathroom or possibly to readjust my pregnant body, I usually can't go back to sleep because my mind is racing with thoughts. Lately, I haven't allowed myself the time to sit down and write about my thoughts. Perhaps I've had too many, or not enough that have been worth sharing. This morning (among many other thoughts) my mind and heart is turned toward my dear family members who are hurting because of an unexpected loss in our family. My step-dad's niece, Ali, was the victim of domestic violence (reported in this news story). I would never try to compare what happened to us and our loss of Luke to this situation. Nevertheless Trevor and I have felt the power of a parent's love for their child and have felt the pain of unexpected loss. And because we have felt emotions connected with parental love and loss our hearts are that much more tender and full of ache for Ali's parents and all those that loved her. I wasn't close to Ali, but was so immensely touched by her consideration, love, and generosity when we lost Luke. She and her dad came to Luke's funeral to offer their love and support and condolences to us. Because we weren't very close, I was so touched that she would make that effort for us. In addition to being there to offer love and support she and her dad gave us the beautiful piece of artwork pictured below. I couldn't believe how thoughtful they were. Ali, your kindness touched me and I will be forever grateful for the love you showed our family. Your parents, children, other family members, and friends will continue to be in our prayers as each of them grieve your loss. May we each be reminded to cherish our loved ones while they are here with us, be a little more loving, and a little more forgiving. Each of our days are numbered, may we cherish every one. 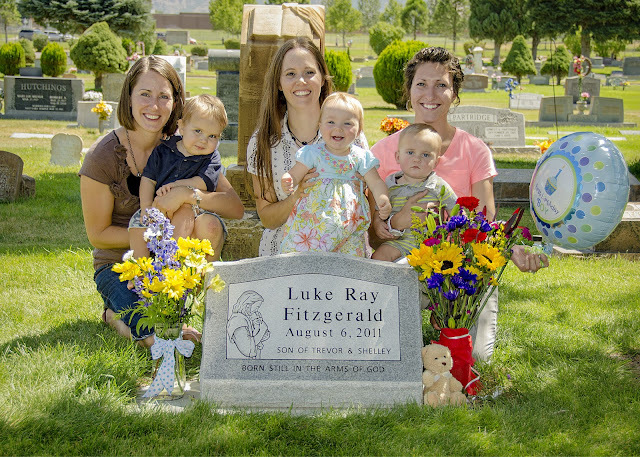 When I was in Utah visiting friends and family I scheduled out a morning to go to the cemetery and visit Luke's grave. Like always, when I would visit the grave, I carefully arranged fresh flowers to leave there. As I pulled up to the gates at the cemetery it almost seemed surreal as the thoughts ran through my head almost as a reminder of my reality I have a son who I gave birth to and he is buried here. There's not a day that I have forgotten that, but something about being back there at the cemetery after nearly 5 months seemed to confirm that reality stronger in my mind. I brought items with me to clean the grave. The cemetery does a great job maintaining the grounds, but I thoughts Luke's headstone might need a little maintenance. It sits under a try that drops these little berry-like things that can leave spots on the granite. I scrubbed down the headstone and removed grass clippings that had pilled up around the edges from a recent grass clipping. While other moms spend there time wiping down little cheeks that are covered with spoonfuls of baby food that have gone astray, I spend my time careful wiping down the headstone that marks the sacred ground in which my son is buried. Being there reminded me how much I miss being able to go to the cemetery whenever I wanted. The cemetery is always a quiet, peaceful place to be. I miss being able to go there. I miss the quiet times of reflection that occur there. I miss being able to leave fresh flowers to honor my son. Luke it's hard to not let myself imagine what life would be like if you were here with us. I try to not dwell on thoughts like those. But the fact of the matter is that you are missed and we do wish you were here with us. But you're not here. At least you are not here in your physical tabernacle of a body. Perhaps your spirit is close. I hope it is. I continue to put my faith in God and trust in His plan. I know we will get to be with you again some day and I will continue to look forward to that time. Life goes on, but at certain times there simply feels like a void in our life or rather -- in our family. We were so fortunate to have spent the past week at a beach house in Delaware with Trevor's family. Each summer Trevor's family get's together for a week-long vacation at Lake Chelan in eastern Washington. This year my sister-in-law suggested everyone come to the East Coast instead, so we opted for a week at Rehoboth Beach in Delaware. Trevor's parents, sister, and our niece all arrived the same evening. We all gathered for dinner at Scott and Maryanne's house. The energy and excitement of travel, being together, and the anticipation of our trip to Delaware was practically tangible. It was a bit of chaos as excited children began to play with each other, clamor for attention, fight over toys, try to escape the madness, and even eventually some minor injuries ensued. Though it was a relief to not have any disciplining or fight-settling or injury recovery to be a part of, it was hard to not have Luke there in that crazy mix of things. This initial evening of being all together seemed to exaggerate the lack of Luke's presence more than normal. As I sat and watched all the craziness I couldn't help to wonder what it would be like to have just one more cousin in the mix of things. One more gleeful excited or perhaps overwhelmed and crying child. The day after we arrived in Delaware, we took a Sunday evening stroll to see the beach. Perhaps it was being in such a beautiful, serene place that made my emotions more prevalent. I couldn't help getting emotional seeing all the family together ... but knowing it wasn't all the family. Missing Luke and feeling so empty-armed, I asked my sister-in-law if I could hold her baby. What peace it brought to at least have someone in my arms who I love, yet how I still longed for it to be my own child. Yet again, I couldn't help to feel the void of having Luke be a part of the family adventures when we all went to a place called Funland. It's just a small place on the boardwalk of Rehoboth beach filled with little amusement rides mostly for kids. 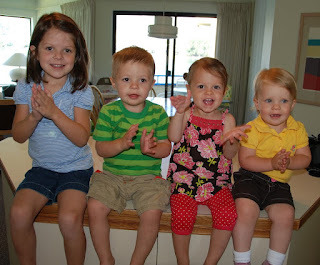 There was just something about seeing all the little cousins together, having fun. I couldn't help my mind from thinking what it would be like to have Luke there with them. There were even some small babies strapped in on the firetruck ride. It was a perfect ride for little ones that age. Will this void remain in coming years when we do have little ones to add to the mix of craziness? I'm not sure. I am certain having our next son (and any other subsequent children whom we might be blessed with) will keep us occupied and allow our family to be more in the mix with all the kids. Perhaps the void won't be so exaggerated or quite as emotional. Yet, in a way, I hope that I always feel this void. I hope that I always feel like someone is missing, because he is. Our family simply isn't complete without Luke. Nevertheless, I know he's not supposed to be here now. I know God has a plan for him and for our family on earth. I know our family will all be together one day. This just isn't the time. Knowing that makes things easier. Knowing that brings comfort. But the tears still come, because I miss Luke. And I'm okay with that. We want to meet our new cousin!!!!!!" I suppose not a lot has changed since then because we still can't wait to meet you! You never know when it will come. You never know what's going to be a hard moment. You might anticipate unpacking nursery boxes, setting up the crib, and arranging the furniture in the new nursery would be hard. You might think going through piles of clothes to find some to lend to Luke's 3-month cousin would be hard. You wouldn't think unpacking boxes of office stuff wouldn't be emotional . . . but there I was . . .sorting through books, papers, old text books to be sold, and other office odds-and-ends that still need to be unpacked, organized, thrown out, sold, or stored . . . and it hit me. I came across a particular notebook and an old calendar/day planner. As for the notebook. I had used it for a while during pregnancy to chart what I was eating each day and to mark off my daily essential pregnancy routines (drinking enough water, pregnancy tea, exercise, birth class practice, prayer, scripture study, singing to Luke, etc.). As I turned the pages my charting ended abruptly and was followed with a new to-do list --funeral plans. My heart ached to see these two sections of my notebook juxtaposed against each other. It was my life and my reality and I lived it, but seeing it written like that made it hit me in a new way. Or at least reminded me of what I did and what my life really entailed. I set the notebook aside with a heart of both hurt and love. I picked up my calendar which happened to follow the school year Fall 2010 to Summer 2011. I flipped through it and it fell right open to February. Marked with a big heart was February 21. Trevor and I were celebrating Valentine's Day that day since I had to work (two jobs) on the 14th. For part of our celebration we scheduled an ultrasound so we could find out Luke's gender, read the results together at a park at sunset, and discussed names over dinner. Seeing that day marked with a big heart, I couldn't help but to weep. I continued to thumb through the pages . . .each page marked with either actual pregnancy related events like prenatal appointments, birth classes, baby showers, and my little check-lists of things to do to prepare Luke's arrival or events that simply occurred while I was pregnant like my mundane work schedule, our trip to San Fran, and anything else that was written between November and August. I couldn't throw the calendar away. I felt like I would be throwing away the only memories that I have with Luke. I'm grateful for the memories. I am grateful for the nine months I got to be with my baby. I am grateful Trevor was only gone to the store when I found all of these things so I could stand in his arms to cry some more once he returned. Still love and miss you, my son. Not only did my wonderful friends visit Luke's grave on the first anniversary of his birth they sent me these beautiful flowers. I was so surprised by the unexpected arrival. As if going to the cemetery wasn't more than enough! These flowers were so meaningful to me because I knew that the flower choice had been selected particularly based on some of my favorites which had been in Luke's casket flowers. Knowing this pregnancy has caused so much anxiety and fear, these friends also sent us fetal doppler as somewhat of a "birthday" gift. Trevor and I decided to give it a try for the first time Sunday morning (August 5, 2012). Luckily I'd been feeling kicks already that morning when we woke up as we laid in bed chatting, so I was sure we were going to find a heartbeat. Trevor is a pro and found it the moment he put the doppler to my stomach. It worked like a charm and we are so grateful for this gift that can offer us a little peace of mind in the coming weeks. 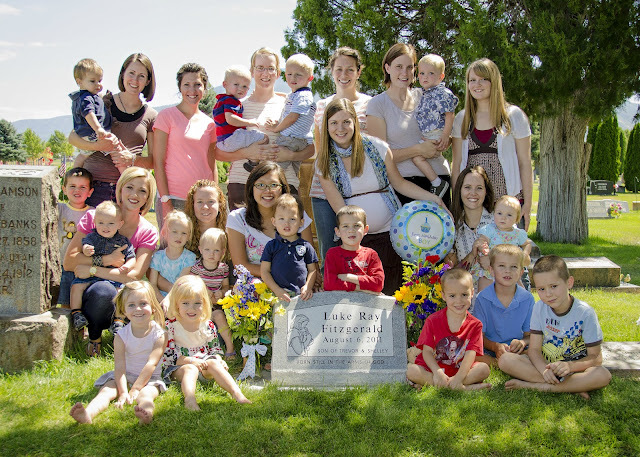 All that these women did for me to honor Luke and the 1 year mark of when I gave birth to him was so touching and I am forever grateful for their love, friendship, and service. 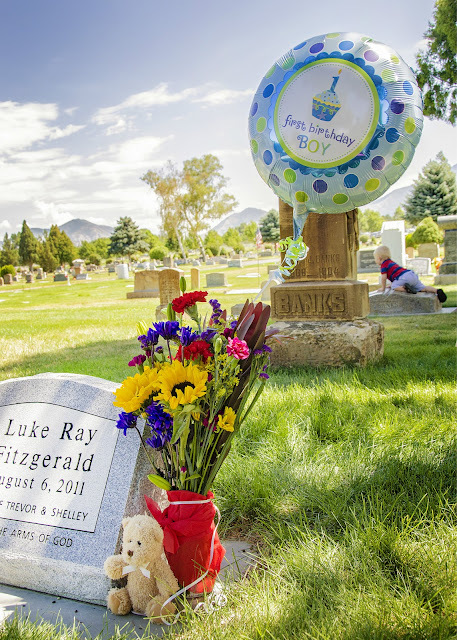 Before the 1 year anniversary of Luke's birth my friend Jenny told me that some of my friends from Provo were planning to go to the cemetery since they knew I couldn't be there. She wanted to make sure I was okay with that and verify the location of Luke's burial place. 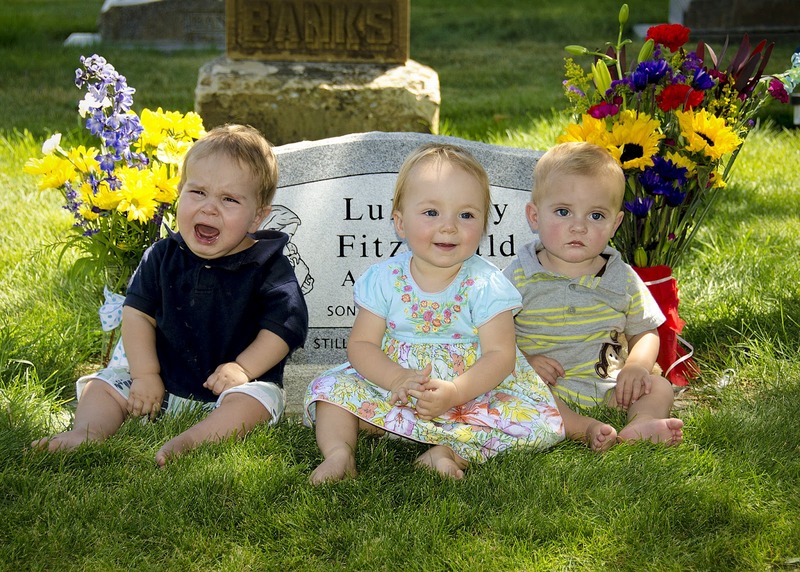 It meant enough to me that they remembered it was Luke's "birthday," and I was so deeply touched to know that my friends were planning such a meaningful excursion to the cemetery. 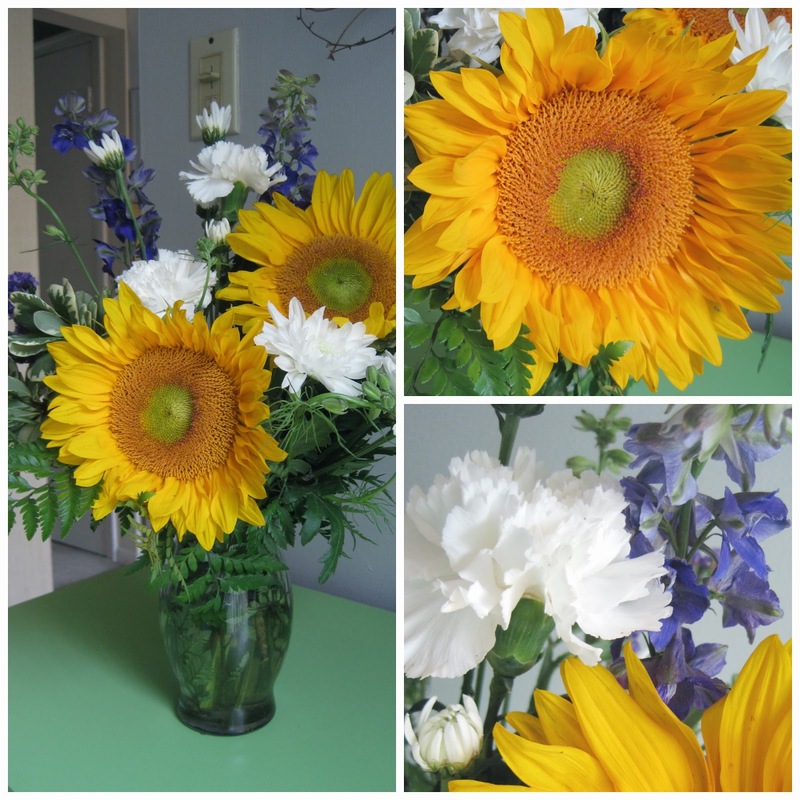 I knew they were taking flowers and had requested they send me some pictures of their visit. I didn't really know who was involved and pictured just few people would go down there. I couldn't quite tell yet who was who since the photo was small, regardless, I couldn't believe the shear multitude of people who were there! I felt so overwhelmed by the outpouring of love from these woman who are my friends. To see that each of them had taken the time and made the effort to gather up their children to go down to the cemetery (at least 30 minutes from where most of them live and much further for others) just for me and for Luke was so incredible to me. As I write about it now, I struggle to find the words to describe my astonishment and my gratitude. It's humbling to be the recipient of so much love and such a kind gesture. My heart was filled with their love. I wanted so badly to be able to put my arms around each one of them and thank them. I hope they each know how much this means to me. Each of these babies pictured below were born within days or just a few weeks of Luke's birth. These are my friends who I went through pregnancy with. These are some of my experienced mom friends who I could turn to with questions about pregnancy, birth, and all things baby. It might be hard for some people to see a picture with their friends and their 1-year-old babies. For some people, I might imagine, it would elicit feelings of jealousy and pain. Yet, for me, it doesn't. Because not only are these my friends who went through pregnancy and birth the same time as me, these are some of my friends who cried with me and for me, who prayed for me, who let me hold their babies when I felt so empty-armed. These are women who I love and I feel so unbelievably grateful to have in my life. I wish I could wrap my arms around you and thank you each individually for your love, prayers, support, and thoughtfulness. I love and admire you all so much and feel so blessed to be acquainted with each of you. We had dinner at our family's house and my niece presented me with this drawing. I love that my nieces and nephews know that we have a son, Luke, who is not with us, but that we'll see him again. I love the simplicity of a child's words: "Sorry your son [died]." What a tender and caring six-year-old. Her drawing means so much to me. Grandma Barb and Grandpa Jim sent us this beautiful arrangement. It arrived on Saturday the 4th. Like I wrote about here, Saturday was the day of the week Luke was born. My mind was full of reflection and coming home to flowers and a note from Trevor's parents couldn't have been more perfectly timed. Grandma and Grandpa Banks took fresh flowers to the cemetery on Sunday the 5th. It means so much to us to have fresh flowers on Luke's grave. 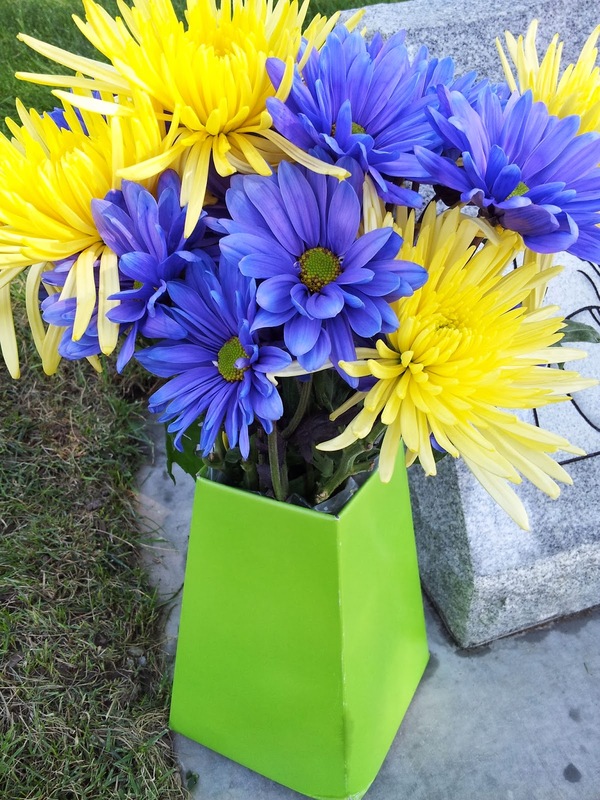 I love that my mom picked out blue delphinium (like the ones that had been in Luke's casket arrangement which I picked out for him) and bright, cheerful yellow flowers. Luke, you have such loving grandparents who continue to show their love for you even though you are not here with us. We feel so blessed to be part of such a loving family.